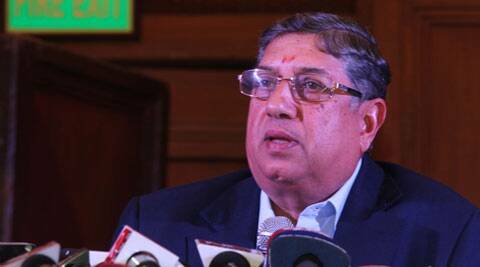 Srinivisan requested for a reconsideration of interim order whereby the court had replaced him with Gavaskar. Questioning the worth of “unsubstantiated allegations” that compelled him to step aside, ousted BCCI president N Srinivasan has made a pitch before the Supreme Court, asking for permission to let him resume his office once again. Srinivasan said he sent his proposal only as the court had directed the BCCI to convey an arrangement without having him at the helm, but it all seemed to be based on uncorroborated accusations. “I respectfully state that I did make the offer to step aside from my position from the BCCI till the conclusion of independent enquiry and it was made as part of the proposals given by the BCCI to this Hon’ble Court on March 27. I have already explained the circumstances under which that offer was made,” he asserted in his plea, which comes up for hearing on Wednesday, the same day IPL 7 starts in Abu Dhabi. “I am highly aggrieved by the unfair and unsubstantiated allegations made against me in the course of hearing of the above matter on 27-03-2014. Further, I am personally not aware of the reason why this Hon’ble Court orally expressed that I should not continue as President of BCCI,” stated his affidavit. Srinivisan requested for a reconsideration of interim order of March 28 whereby the court had replaced him with former Indian skipper Sunil Gavaskar as the Board’s interim President for managing the affairs of the seventh edition of the IPL. For the rest of the work of the BCCI, senior-most vice president Shivlal Yadav was asked to discharge the functions of the president of the board. While contending there was no provision in the BCCI Rules to have an interim president, he maintained: “I am not under any enquiry or probe and hence, there is absolutely no reason for me to be kept away from my office. I wish to resume my elected office. My term ends September 2014 and I should be allowed to complete my tenure.” The affidavit added there was “absolutely no reason” why he should not be permitted to resume office as elected President of BCCI unless and until the court “conclusively” found material suggesting he had interfered with investigations. “I have never interfered with any part of the disciplinary proceeding or the criminal investigation into my son-in-law and I unconditionally undertake that I will continue to do so in the event this Hon’ble court directs any such proceeding,” Srinivisan assured the court. Srinivasan further refuted the panel’s indictment that he lied and tried to cover up the role of his son-in-law by stating Meiyappan was a mere “cricket enthusiast” and he had nothing to do with CSK. He also countered the charge of suspended IPS officer G Sampath Kumar, who had initially probed the betting and spot fixing, of influencing the investigation.